I’ve always loved these salty, buttery treats. But in the past limited my consumption to trips to Hawaii, or to the one or two canisters I would bring home from one of those visits — those usually saved for cooking. But I’m a snacker, and looking for a healthier alternative to salty potato chips, I thought I’d purchase a bag of the Australian dry roasted macs at Trader Joes. Surely the $8+ price tag would keep me from developing a habit, I thought. As I polished off the last of my bag of macadamias, I looked at the nutritional information on the back of the package. A serving contained 40% your daily recommended intake of fat, and 20% the recommended saturated fat. There were 8 servings per bag. I had just eaten half the bag, which meant I got 160% of the fat I was supposed to have for the day, and 80% of the saturated fat. Now all of this might be okay if I was an ascetic, living in a cave and chanting from dawn to dusk, eating nothing more than half a bag of macadamias. But still ahead was dinner — two fish tacos, one quesadilla with chorizo, refried beans and ceviche. Not to mention several margaritas. From the perspective of the nutritional folks at the FDA, I was clearly in trouble. Perhaps I should consider the habit of snacking in general, and not shoot the messenger. After all, as the Macadamia Nut Association is quick to point out, the fat in macs is the healthy monounsaturated kind and they contain a good deal of fiber. So what is the underlying reason, then, that I make regular trips to the cupboard in search of something salty and fatty (I’m not a sweets guy) to satisfy my snacking urge? What deep emotional need am I trying to fill with potato chips or Japanese crack snacks? I’ve noticed that I often get up from my computer and wander into the kitchen for a snack when I need a break from my work, or when I’m thinking about something. Maybe I should go outside and pet the chickens instead. Or maybe I should just not worry about this particular habit. After all, I’m at the low-end of the ideal weight for my size and age, I have low cholesterol and body fat. And even the fattiest nuts have to be better than cheese puffs, right? Perhaps there were more important things I could be thinking about. 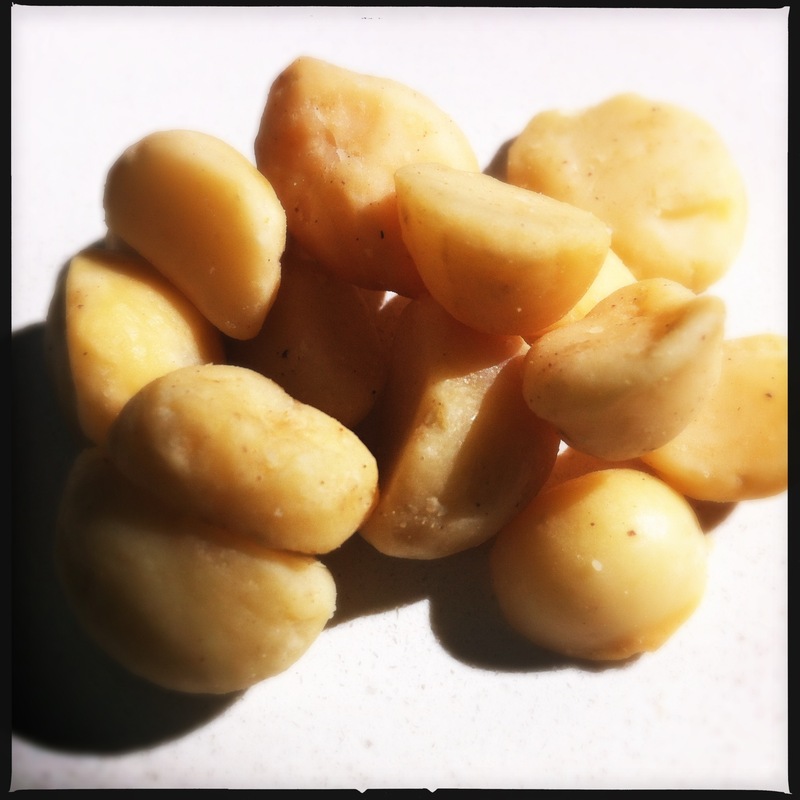 There are, of course, other functions for macadamia nuts besides compulsive snacking. Last night, for example, I coated a gorgeous piece of sashimi-grade salmon with finely chopped macs, flash-fried it in a little canola oil, and served the rare slices over wilted ginger spinach with a cilantro-jalepeño ponzu salsa. But if you decide to make this, just be careful — knowledge of those macs sitting in the cupboard is a powerful temptation. You’ve been warned! Make the cilantro-jalapeño ponzu salsa beforehand, and set aside. Wilt your spinach: In a large skillet, heat grapeseed oil over medium high. Add ginger, stirring once or twice, until golden. Add spinach and toss. Remove pan from heat, and sprinkle in teaspoon of soy sauce. Coat the salmon fillet thoroughly in the chopped macadamia nuts. Heat the canola oil over high heat in a medium skillet until it begins to smoke. Turn heat down to medium. Place salmon in pan and sear, about 30 seconds on each side, browning macadamia nuts. (Toss any extra chopped macadamia nuts you have leftover into the pan, too, to toast.) Remove salmon and excess macadamia nuts to a cutting board. With your sharpest knife, slice salmon into sashimi slices 1/2 inch thick. To serve: Set out four plates. Divide spinach evenly among the four plates, creating a small bed of spinach on each. 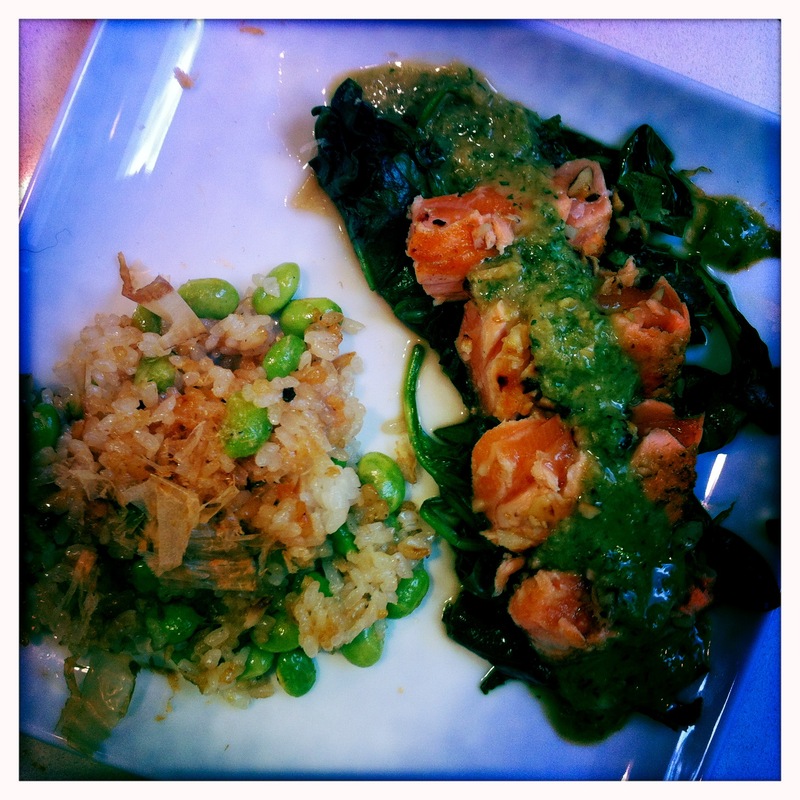 Place 3 or 4 slices of salmon on top each spinach bed, and drizzle a tablespoon of ponzu salsa over the top of each. Place all ingredients in a food processor and puree for 20-30 seconds until smooth. Serve immediately or store in a container in the fridge, stirring before use. Wow, I’m gonna have to make that one. Thanks for the recipe. The first time I had Mac nuts outside of Hawaii Mark Taylor came over for lunch one day when he owned the restaurant and cooked halibut coated in Mac nuts. It may be the best coating nut of them all. I would love the fried rice recipe as well. It all looks so yummy. LOL, I had a feeling someone was going to ask for that. Okay, I’ll pop it up tomorrow. I make a coconut & macadamia encrusted mahi-mahi all the time. (Unfortunately, I’m back on the vegan cleanse again.) Your recipe sounds great though and I’ll make it soon on one of my cheat days. Yeah, I bet that’s great. I cook w/ mahi a lot when I’m in Hawaii. Nuts are a great snack, but the portion is only 2 tbsp. 2 tbsp!! Yeah, that’s a great portion… for a SQUIRREL!! !